General oblique aerial view centred on the military road and traverses, taken from the SE. Oblique aerial view centred on the military road, taken from the ENE. 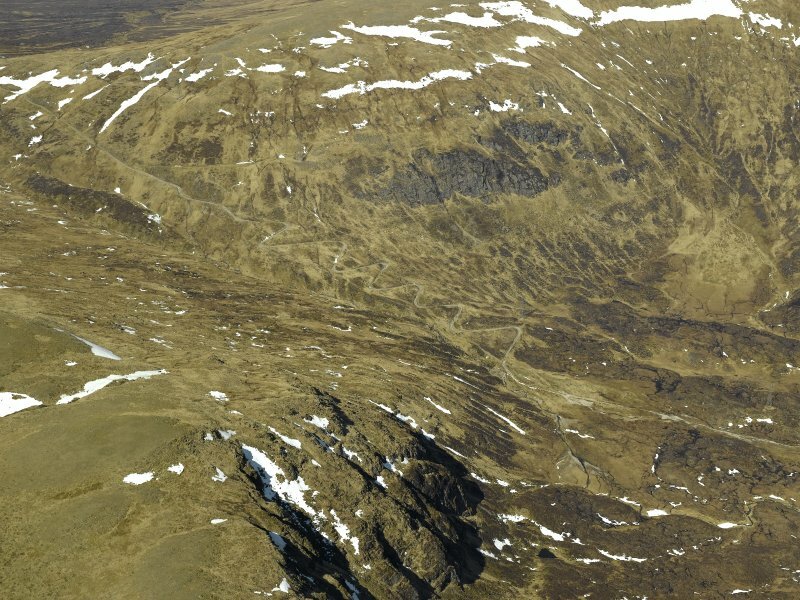 Oblique aerial view centred on the military road and traverses, taken from the SSE. 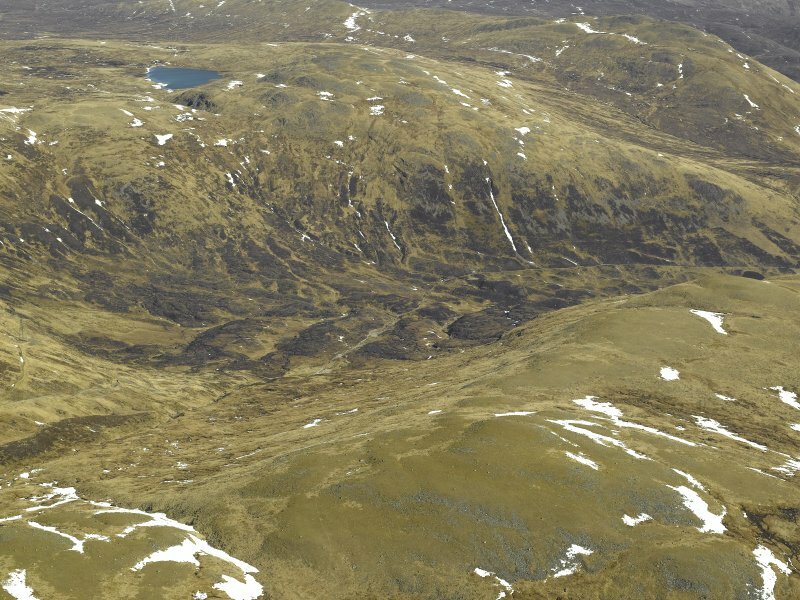 The military road remains to the E of the Allt Yairack as it continues its ascent from Melgarve to the summit of the Corrieyairack Pass, which is over 2,500 feet above sea level. It rises approximately 1,000 feet in two and a half miles, a further 500 feet remaining to climb from the start to finish of the hairpins or traverses (NN49NW 2.03) from NN 4298 9836 to NN 4258 9842, which carry the road through the pass. The road descends from the summit initially quite gently and then becoming increasingly steeper, as it heads W passing to the NE of the Allt Coire Uchdachan. J B Salmond 1938; W Taylor 1976; J and A Baker 1982. The condition of the military road coming from Melgarve deteriorates as it heads towards the traverses, although it can be regarded as generally good to fair. A certain amount of continuing water erosion occurs due to the fact that several small streams cross the track in this stretch and the lack of a satisfactory drainage system causes the track to appear like a stream bed in wet weather. There have been slight changes in the original straight alignments of the road, the modern track following a more irregular course. Along the route edges, overgrown fragments of original or earlier road fabric are visible and at intervals patches of old cobbled road surface can be seen in this section. A small wooden bridge (NN49NW 2.01) at NN 4427 9763 is fairly ineffectual as the stream runs over it as well as under in wet weather. To the W of the undateable remains of another bridge (NN49NW 2.02) at NN 4342 9838 the military road appears to have followed a different course from the present track for a short distance. The Corrieyairack traverses (NN49NW 2.03) from NN 4298 9836 to NN 4258 9842 take the military road through the pass.The track descending from the traverses is initially in fairly good condition, despite the fact that a certain amount of water flows across the track. However, the condition deteriorates as the road heads W to Meallan Odhar Beag and becomes poor, with signs of vehicle damage along the road edges in places. In the area of NN 4069 9905 there are faint traces of a possible back ditch visible approximately 4m from the N side of the track. At the same location a section of stone walling can be seen within the upper slope, the middle part of which has been built in a semi-circle apparently to incorporate a small spring. The road heading W, which is in a reasonable condition, despite a few more severely eroded areas, displays fragments of cobbled paving at intervals. M Logie (Highland Council) 1997; NMRS MS 1007/4. NH 374 071 - NN 462 961 A watching brief was maintained over the Dalwhinnie to Fort Augustus military road or Corrieyairack Pass, focusing on the section from Fort Augustus to Melgarve which is a Scheduled Ancient Monument (NMRS NH30NE 21, NH30SE 2, NN39NE 2, NN49NW 2, NN49NE 2, NN49NE 3, NN49NE 4 ). The road was being used for the refurbishment of an electricity pylon line. The N part of the length of road covered by this record falls within the parish of Laggan. Information from RCAHMS (RJCM), 8 June 2006. 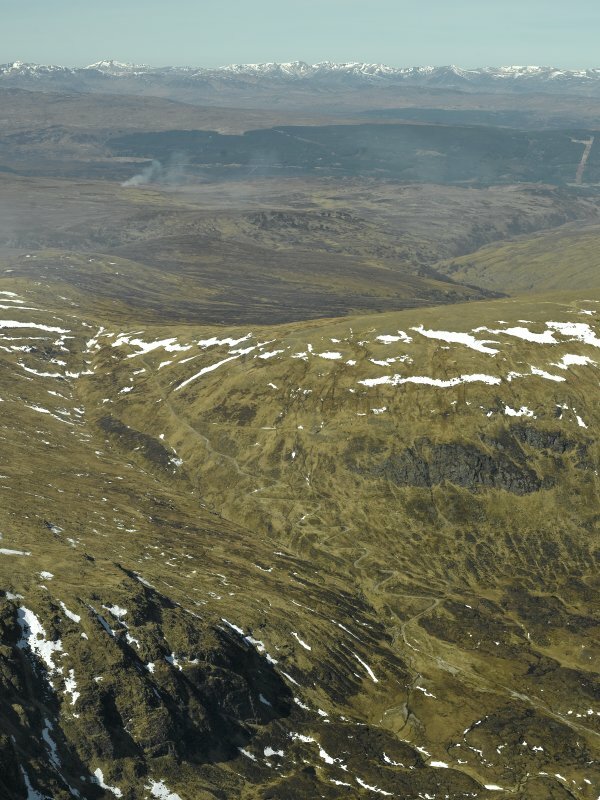 A watching brief was conducted between June 2011 and October 2013 for upgrading of access on the Corrieyairack Pass, which included the importation of material and drainage and repair works. Work revealed limited archaeological features to the area of the road, the road has seen extensive damage in parts due to flooding and erosion.